To Cite: TaheriChadorneshin H, Abtahi-Eivary S, Cheragh-Birjandi S, Yaghoubi A, Ajam-Zibad M. The Effect of Exercise Training Type on Paraoxonase-1 and Lipid Profile in Rats, Shiraz E-Med J. 2017 ; 18(7):e46131. doi: 10.5812/semj.46131. Background: Paraoxonase-1 (PON1) is an anti-atherosclerotic enzyme that protects high-density lipoprotein (HDL) and low-density lipoprotein (LDL) against oxidation. There are contradictory studies about the effects of exercise training on PON1 activity. Objectives: The purpose of the present study was to elucidate the effects of sprint and endurance exercise training on serum PON1 activity and lipid profile in rats. Methods: Twenty-four Albino Wistar rats were divided to sedentary control (SC), endurance training (ET), and sprint training (ST) groups. The animals were subjected to endurance (at a speed of 27 m/minute) and sprint (at a speed of 40 to 54 m/minute) training on a treadmill for 6 weeks, 6 days per week. Using commercial kits, PON1 activity and lipid profile levels were measured by spectrophotometry and enzymatic methods, respectively. The data were analyzed by one-way analysis of variance followed by Tukey’s post-hoc test at P < 0.05 level. Results: Both ET and ST regimens increased PON1 activity in the serum, and the alteration was greater following ST than ET (F1, 23 = 17.87, P = 0.001). In contrast, neither ST nor ET changed significantly the serum levels of triglyceride (F1, 23 = 0.288, P = 0.753), total cholesterol (F1, 23 = 0.385, P = 0.685), LDL (F1, 23 = 1.07, P = 0.361), and HDL (F1, 23 = 1.36, P = 0.277). In addition, serum PON1 activity was positively correlated with serum HDL levels in rats (R = 0.44, P = 0.032). Conclusions: Despite the lack of change in serum lipid profile, sprint training can lead to greater protection against lipid peroxidation than endurance training through increases in serum PON1 activity. There is increasing evidence that paraoxonase 1 (PON1) and high density lipoprotein cholesterol (HDL) could be involved in atherosclerosis disease (1). High density lipoprotein removes cholesterol from the wall of the arteries and transmits it to the liver (2). Furthermore, HDL has antioxidant, anti-inflammatory, antiapoptotic, and antithrombotic properties (3). The anti-oxidative property of HDL has been attributed to PON1 activity (4). PON1 is a calcium-dependent enzyme (5), which is synthesized and secreted from hepatic cells (4). It is located on HDL (6) to prevent the oxidation of both HDL and LDL (2, 4). The activity of PON1 is known to depend on disease status, life style, and exercie training (1, 4, 7). In this context, it has been shown that long-term aerobic (4) and anaerobic (8) exercise trainings increase PON1 activity and HDL levels in sedentary (4) and active females (8), respectively. In addition, an increased PON1 activity and HDL levels has been revealed following short-term exercise training in football players (7). Furthermore, intense aerobic exercise training corresponds to 60% to 85% maximum heart rate (2, 3, 5), resulting in increased PON1 activity, while no significant changes occur in LDL, HDL, and TG levels. In contrast, other researchers have reported that vigorous and moderate aerobic exercise trainings have no significant effects on PON1 activity and lipid profile levels (9-11). Also, no significant change in PON1 activity and lipid profile has been reported following resistance exercise trainings (2). Moreover, Tas and collegues reported a reduction in serum PON1 activity following 8-week continuous and interval trainings (12). It has been suggested that low serum PON1 activity is significantly associated with an increased risk of atherosclerotic disease (4, 7, 13), type 2 diabetes mellitus (10), myocardial ischemia and infarction (9, 14), metabolic syndrome (3), and coronary artery disease (1). Therefore, to protect against these conditions, it is important to monitor one’s serum PON1 activity as well as lipid profile levels through an appropriate exercise training program (4). However, the effects of exercise training on serum PON1 activity and lipid profile have remained controversial. In addition, there are trainings that are performed at high intensity. To the best of our knowledge, the effects of different types of exercise training with maximum effort on PON1 activity and lipid profile have not yet been well examined. Hence, the aim of the present study was to investigate the effects of different types of intensive exercise trainings (enduranc and sprint) on serum PON1 activity and lipid profile levels in rats. Twenty-four mature male Albino Wistar rats (body weight equal to 250 to 300 g) were obtained from animal care centre, Mashhad University of Medical Sciences, Iran. The animals were housed in a room with 12 hour light/dark cycle, at a temperature of 22°C ± 2°C. They had free access to tap water and standard chow pellets (Javaneh Khorasan company, Mashhad, Iran). After they were familiarized with running on motor-driven treadmill (5 days, 10 minutes/day at a speed of 10 m/minute) (15), the rats were randomly divided to equal groups (n = 8) of sedentary control (SC), endurance training (ET), and sprint training (ST). The experimental procedures were carried out according to the guidelines for the use and care of laboratory animals (“Principles of laboratory animal care”, NIH publication No. 86 - 23. revised 1996). Endurance and sprint exercise trainings were performed on the basis of overload principle on a treadmill for 6 weeks, 6 sessions per week (16). In brief, the rats in the ET group ran on a treadmill at 27 m/minute (corresponding to 80 % VO2max). Furthermore, animals in the ST group ran on treadmill at 40 and 54 m/min on odd and even days, respectively (corresponding to 95% to 100% VO2max). Overload was exerted by increasing time and intervals in ET and ST groups, respectively. Warm-up and cool-down were performed at 16 m/minute (corresponding to 68% VO2max) at the beginning and end of ET and ST. Active rest was performed between intervals in the ST group for 60 seconds at 16 m/minute (16). The rats were motivated to run by a mild electrical current on a treadmill (0.5 mA, 1 HZ) (15). The rats in the SC group were exposed to the same environment as the ET and ST group without running (15). Fasting rats were sacrificed 48 hours after the last training session under anesthesia (Ketamine, 60 to 80 mg/kg and Xylazine, 8 mg/kg; IP). Blood samples were taken via cardiac puncture and serum was obtained by centrifugation (4°C, 4000 g, 15 minutes). Finally, serum was frozen in liquid nitrogen and stored at -80°C before determination of PON1 activity and lipid profile levels. The PON1 activity was assayed spectrophotometrically in the serum using commercial 96-well enzyme linked immunosorbent assay (ELISA) kits (# RL-0031, Relassay, Gaziantep, Turkey). The assays were carried out according to the manufacturer’s instructions. The HDL, total cholesterol (TC), and triglyceride (TG) levels were measured by enzymatic methods (Parsazmoon Co., Karaj, Iran). Finally, serum LDL levels were determined by the Friedewald equation (LDL = TC - HDL - (TG/5)). Data were analyzed by statistical package for social sciences (SPSS Inc., Chicago, USA) software, version 16.0 and expressed as mean ± standard deviation. After determination of normality and homogeneity of variances by Shapiro-Wilk’s and Levene’s test, respectively, the data were statistically analyzed by one-way ANOVA followed by Tukey’s post-hoc test used to determine differences (P < 0.05). In addition, Pearson’s correlation coefficient was calculated to determine the relationship between variables. 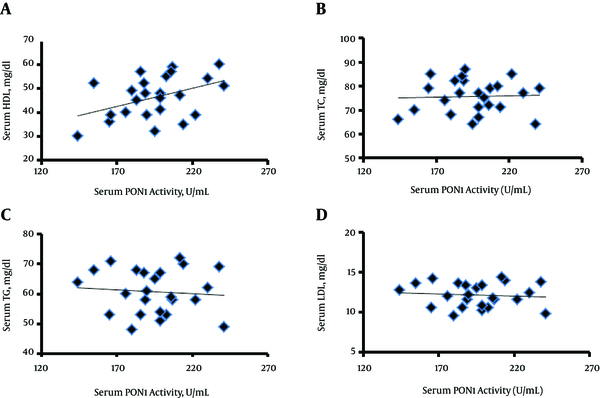 The results showed a significant difference in serum PON1 activity among different groups (F1, 23 = 17.87, P = 0.001). Animals in the ST (218 ± 16.86 U/mL) (P = 0.001) and ET (195 ± 11/10 U/mL) (P = 0.015) groups had significantly higher PON1 activity compared to those in the SC (171 ± 17.95 U/mL) group. Besides, ST induced a greater increase in serum PON1 activity than ET (P = 0.022) (Figure 1). The asterisk (*) indicates a significant difference from SC. The hash sign (#) indicates a significant difference from ET. In the context of lipid profile, the results showed no significant difference in serum TC levels between ST (74.38 ± 7.09 mg/dL) (P = 0.976), ET (77.38 ± 7.42 mg/dL) (P = 0.804), and SC (75.12 ± 6.81 mg/dL) groups (F1, 23 = 0.385, P = 0.685) (Figure 2A). Also, there was no significant difference in serum TG levels between ST (61.25 ± 7.81 mg/dL) (P = 0.843), ET (61.88 ± 6.68 mg/dL) (P = 0.752) and SC (59.12 ± 8.21 mg/dL) groups (F1, 23 = 0.288, P = 0.753) (Figure 2B). In addition, neither ST (49.38 ± 7.46 mg/dL) (P = 0.253) nor ET (46.75 ± 10.48 mg/dL) (P = 0.572) had a significant effect on serum HDL compared to SC (42.38 ± 7.36 mg/dL) (F1, 23 = 1.36, P = 0.277) (Figure 2C). Abbreviations are the same as denoted in the legend of Figure 1. Finally, the findings of the current study revealed no significant difference in serum LDL levels between ST (12.50 ± 8.83 mg/dL) (P = 0.347), ET (17.87 ± 9.20) (P = 0.908) and SC (20.12 ± 9.73 mg/dL) groups (F1, 23 = 1.07, P = 0.361) (Figure 2D). As depicted in Figure 3, the results of the current study showed a significantly positive correlation between PON1 activity and serum HDL (r = 0.44 and P = 0.032) (Figure 3A). However, there were no significant correlations between PON1 activity and serum TC (P = -0.035, P = 0.871) (Figure 3B), TG (R = -0.088, P = 0.682) (Figure 3C), and LDL (R = -0.20, P = 0.342) (Figure 3D). In previous reports (5, 6) it was pointed out that a high amount of HDL and a low amount of LDL could not solely guarantee cardiovascular health. Nowadays, growing attention is drawn to the PON1 because of convincing evidence that PON1 plays a role in protection from cardiovascular disease (6). 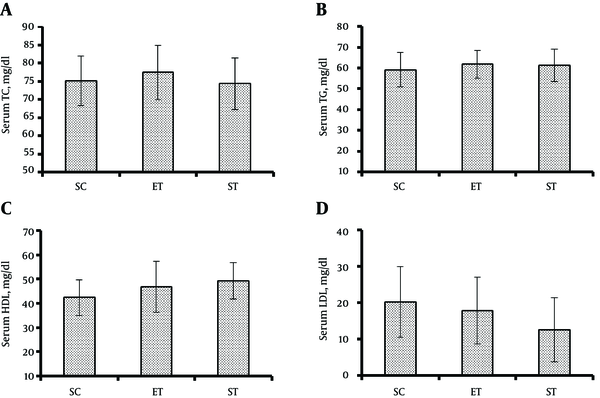 Here, in an experimental animal model, it was revealed that ET (14.03 %) and ST (27.48 %) resulted in significant increases in serum PON1 activity in Albino Wistar rats. However, neither ST nor ET significantly changed serum levels of lipid profile. There is now substantial body of evidence suggesting that anaerobic (8) and aerobic exercise trainings at short and long duration (4, 7) are significant factors against atherosclerosis through increasing antioxidant factors. Furthermore, PON1 is a calcium-dependent esterase (4), bound to the surface of HDL (5), and acts as an antioxidant enzyme (2, 6). This 43-kDa glycoprotein enzyme with 345 amino acids is synthesized in the liver (2) and released in the blood (4). PON1 prevents oxidative modification of LDL and HDL (2, 5), which in turn impedes the development of atherosclerosis (4). Although PON1 activity and concentration are determined genetically, several factors such as diet, lifestyle, and environmental factors can influence PON1 activity (7). The findings of the current study showed that serum PON1 activity increased following endurance and sprint training at high intensity. The results are consistent with previous reports recording an increased serum PON1 activity after 4 to 10 weeks of aerobic exercise training (2, 3, 5). In contrast, the findings are inconsistent with other studies because of their low to moderate intensity of aerobic (9, 10) and resistance (2) exercise trainings. Furthermore, Romani et al. demonstrated that moderate aerobic exercise training did not effect PON1 expression or enzymatic activity in rats (17). It was reported that PON1 activity is greater in female than in male humans (18) and mice (19). PON1 activity varies widely between individuals within the same genotype group and across ethnic variations (4). In addition, it was demonstrated that estradiol regulates the activity and stability of PON1 (20). Therefore, male rats were used in the present study to control the effects of ethnic variations (4) and estradiol (20). In reality, the observed changes in PON1 activity in this study may be due to the exercise training itself. 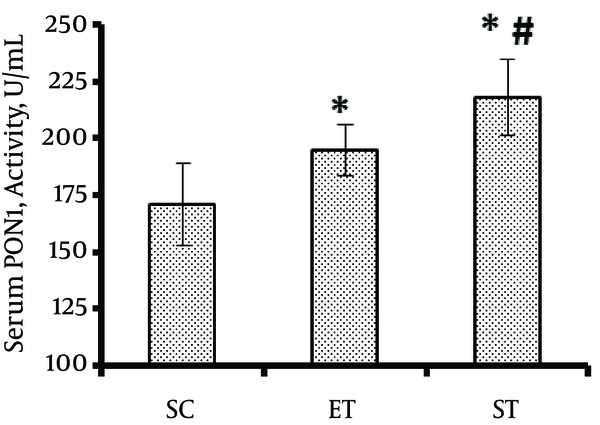 Compared with endurance training, sprint training resulted in greater serum PON1 activity. The molecular mechanisms of the observed increase in serum PON1 activity following exercise training remain unclear. However, this increase could be related to a decrease in lipid peroxidation following exercise training because oxidized lipids are reported to inhibit PON1 activity (7). On the other hand, it has been shown that sprint training leads to further activation of the electron transport chain (16) and shear stress on endothelial cells (16) than endurance training. Thus, further oxidative stress, induced by sprint training, leads to greater adaptive responses i.e. higher PON1 activation. In this context, it has been reported that oxidative stress effects the activity of PON1 (21). In addition, it has been demonstrated that treatment with the oxidant increased PON expression, suggesting that oxidative stress mediated gene expression of PON (22). Furthermore, HDL removes cholesterol from the wall of arteries and transmits it to the liver (2, 23). If HDL is not supported by PON1, it cannot perform its function very well (2, 24). High-Density Lipoprotein acts as an anti-inflammatory agent in healthy individuals, yet is characterized by systemic oxidative stress and inflammation in chronic illnesses (3). The findings of the current study in healthy animals revealed that neither sprint nor endurance training effect serum lipid profile. Intriguingly, other studies have reported no significant change in serum LDL, HDL, and TG levels following exercise trainings at moderate intensity (2, 3, 5). Lipid profile factors are hardly affected by exercise training unless it is accompanied by nutritional modifications (2, 3, 25). Hence, this study was conducted on animals with a similar diet to minimize the effect of nutritional intervention. Furthermore, basic levels of lipid profile determine its response to exercise training (25). In reality, exercise could effect the lipid profile in situations where baseline levels of LDL and HDL are low and high, respectively (25, 26). Basic levels of lipid profile in the present study were normal and this is probably why this indicator did not have a significant change following exercise training. A non-meaningful decrease in LDL concentration following endurance (10%) and sprint (40%) exercise training may relate to increases in activity of lecithin cholesterol acyltransferase (27). In addition, the results of the present study showed a slight increase in HDL concentration after endurance (9.52%) and sprint (16.66%) exercise trainings. These slight increases may be attributable to changes of lipoprotein lipase (28) and cholesteryl ester transfer protein activity following exercise training (29). Besides, the findings are consistent with other studies (5, 30), which showed a positive and significant correlation between PON1 activity and serum HDL levels. Similarly, no meaningful correlation was observed between PON1 activity and other lipid profile markers as reported by other authors (5). Part of this correlation may be due to the facilitatory action of HDL in secretion of PON1 from the liver into the blood and stabilization of the enzyme (4). Although direct evidence is not available in support of this notion, it appears that sprint training, through further increases in PON1 activity, could lead to greater protection against lipid peroxidation than endurance training. This means that training with maximum effort will lead to greater anti-atherosclerosis gains. The results of the present study will help trainers identify the best preventive approach against the occurrence of these diseases. The authors thank the staff of the biochemistry laboratory at Gonabad University of Medical Sciences for their valuable assistance with carrying out the biochemical assays. Authors’ Contribution: Hossein TaheriChadorneshin, Seyed-Hosein Abtahi-Eivary, Sadegh Cheragh-Birjandi, Ali Yaghoubi, and Mahboobe Ajam-Zibad conceived the study and its design and coordination; All authors were involved in the data collection, data analysis, and drafting of the manuscript; All authors read and approved the final version of the manuscript, and agreed with the order of presentation of the authors. Conflicts of Interest: There were no conflicts of interest.